Flexibility and configurability are two of our goals for CNC in 7.1. You read last year about the changes that were introduced with 7.1 — CNC on the fly and automatic tool selection being the most notable. As 7.1 matures, however, CNC is continuing to increase in both flexibility and configurability. This article overviews some of the recent additions to CNC. All of these features have been in response to customer requests. So please continue to make your requests for CNC known, since nearly all of the work on CNC is based on customer reports and requests. On the main CNC setup screen, we have a few new options. First is Include attached submaterial in the member download. This does just what it seems — when you select a series of members to download in CNC, it will grab all the attached submaterial and download them too. (It's subject to restrictions from the material type section below, and to machine limitations, of course). 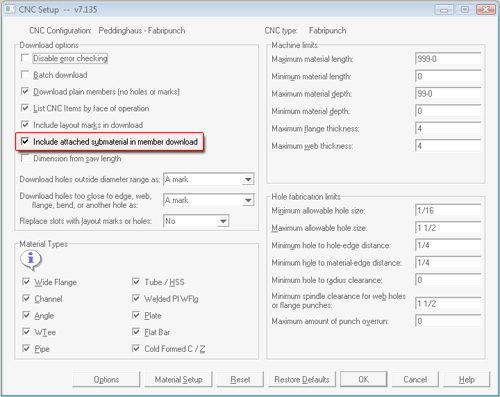 Now that we can download to CNC from modeling, this makes it quite easy to get all the submaterial in a particular area — just select the members, and download with this option. We've heard from a few of you that have shops where you'll cut your material (with the appropriate angle on the end), then burn your copes later. This caused problems with pieces that had an angled end with a cope — when the angle was cut with regards to the length given, the piece ended up too short. These shops needed a way to figure the saw length, not the final length of the piece. Other shops, however, required final length so that less material was wasted. Now this is an option: Dimension from saw length. When this option is off, final length is used throughout CNC. Finally, on this main CNC setup screen, there's an entire new section of options: Material Types. These are designed to allow you more ease and control over your download. For example, you may want to download all of your channels to one machine, and all of your angels to another. 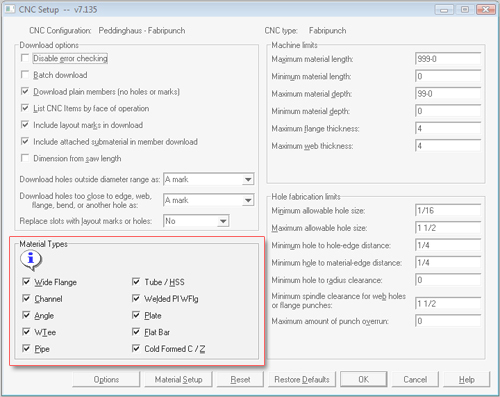 Instead of carefully selecting all the members that are channels, now you can set up a CNC configuration for each machine, select everything for download, and get only the materials that you actually want that machine to handle. 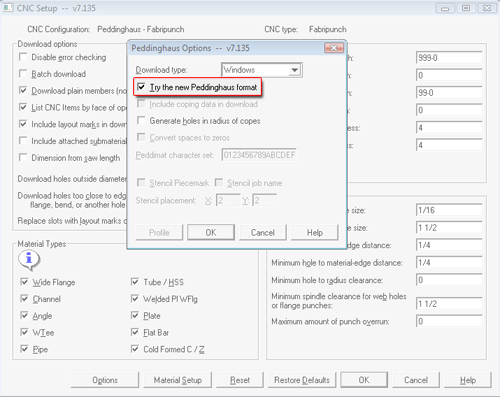 Based on requests to include weld prep data and more complete coping data in the Peddinghaus download, there's now the alpha version of an entirely new Peddinghaus download available for you to try. 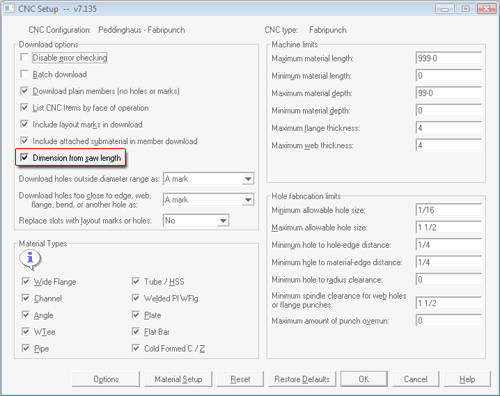 Simply select any Peddinghaus download as your CNC configuration type (avoid Pedd coper), then click Options from the setup screen. You'll see a Try the new Peddinghaus format option. Check it, then download your pieces. After you download, move all the .COP files into whatever directory your version of Peddimat wants them (usually it's a “copes” directory). Then open your files in Peddimat. They should look almost exactly like the DSTV import – but with some of the automatic copes detected. This is still a work in progress, so please let me know what needs to be changed and improved! 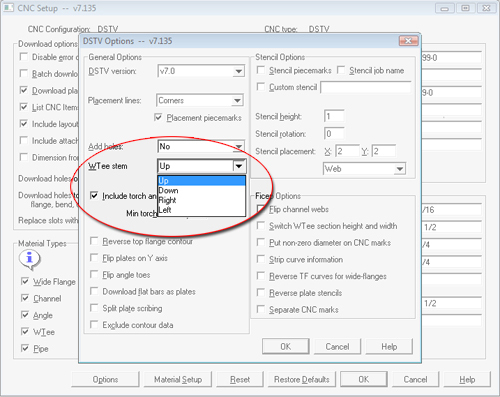 Most of the programming time in CNC is spent on DSTV — it's constantly being improved and given more options. Recently, we added several options that allow minor departures from the DSTV standard for various machines. For example, Wtees can now be downloaded in four orientations: stem up (which is the way DSTV mandates), stem down, stem right or stem left. We hope this will prove useful to those of you who wish to manually nest Wtees. We also added the ability to flip the direction of angle toes in the download; to download flat bars with the PL designation rather than an FL designation; to create multiple files for one plate download, based on their different scribing needs; to flip plates on the Y-axis; and to download only hole information in the DSTV download. You'll also notice, beginning in 7.135, a new section that arose specifically from the needs of customers working with Ficep machines and running Steel Projects – they're in the Ficep Options section. We hope that these new options are increasing the usefulness of CNC for you. Please continue to let us know when you find problems or would like a new feature. We enjoy working for and with you.